As Iraqi refugees flood into Syria and Kurdish forces backed by U.S. airstrikes battle to push back Islamist militants, a war is breaking out in Baghdad. Prime Minister Nouri al-Maliki fired off the threat of legal action against Iraq’s ethnically Kurdish new president, saying in a surprise Sunday night speech that Fouad Massoum had committed “a clear constitutional violation” and carried out “a coup against the constitution” by missing a deadline to name a new premier. Maliki considers the position his, after his Shiite-dominated bloc took the most parliamentary seats in April elections. The move – bookended by the deployment across the Green Zone in Baghdad of brigades loyal to Maliki – signals the embattled prime minister is making a play to hold onto power, with what could be disastrous results. Maliki’s play triggered immediate expressions of concern – from State Department officials tweeting support for Massoum to a pointed message Monday from Secretary of State John Kerry warning against the introduction of force or use of militias. "Taking this position implies that he’s only going to go kicking and screaming and is not interested in sacrificing his own position for the good of the country"
Kerry said that the formation of a government is “critical” to Iraq’s stability and urged Maliki not to add to tensions gripping Iraq - where Sunni militants have declared an Islamic state stretching into Syria. “Our hope is that Mr Maliki will not stir those waters," he said. Hours after Maliki deployed the extra security forces, Iraq's largest coalition of Shiite political parties dealt the prime minister a slap in the face. The Iraqi National Alliance nominated Haider al-Abadi - the deputy prime minister - to replace Maliki. Massoum accepted the nomination - and formally asked Abadi to form a government - but Maliki is broadly expected to resist and dig in his heels. While Maliki’s move to cling to power comes as no surprise to officials and analysts, his timing – and method – have set off particularly loud alarm bells. Since coming to power, Maliki has been broadly accused of divisive policies that have alienated broad swaths of the Iraqi population and fanned the flames of sectarianism. Pressure has been mounting for the prime minister to step aside since Islamic State of Iraq and al-Sham (ISIS) militants launched a rapid-fire offensive through northern Iraq, seizing key cities and leaving a trail of brutality in their wake. Since then, questions have multiplied over whether the Shiite prime minister would step back for the good of the country. The election of Massoum – a Kurd – to the mostly ceremonial presidency was seen as a necessary move towards the more inclusive government deemed critical for Iraq’s survival in the fight against ISIS. In his defiant televised speech Sunday, Maliki accused the new president of missing a deadline to name a new prime minister. Maliki considers a third-term as prime minister rightfully his in light of the April election results which saw his Shiite-dominated bloc take the most parliamentary seats. 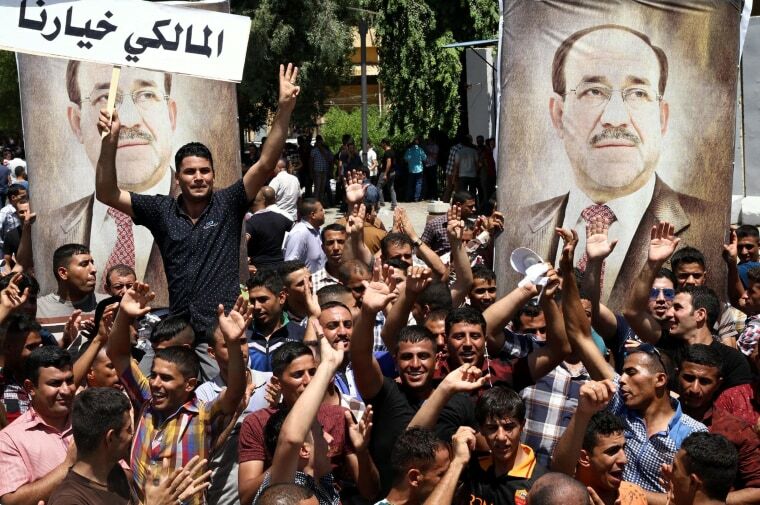 As Maliki over the years has grown increasingly dictatorial – viewed by some as edging closer to a Saddam Hussein figure – what was once seen as unwavering support from the U.S. has shifted. The reaction to Maliki's legal threats made the U.S. break with the prime minister all the more clear. In addition to the expressions of support for Massoum, the U.S. carried out airstrikes over the weekend on ISIS positions in northern Iraq to protect Kurdish fighters near Erbil from ISIS militants, choosing to step in there rather than bolster security in Baghdad. While officials say the airstrikes are helping, ISIS militants are showing no signs of slowing down. The Sunni militants claimed control of the town Jalwla’a on Monday in Diyala province, a senior Iraqi security official told NBC News on Monday. Against that backdrop, any moves by Maliki and the deepening political crisis have taken on added urgency. While no-one could deny that the deadline to name a prime minister had run out, Massoum’s hands were “literally tied behind his back” until the Shiites nominated a prime minister, said Hayder al-Khoei, an Iraq analyst for London-based think tank Chatham House. The president was waiting "for the Shiite bloc to pull its act together." As all eyes shift to see how Maliki will respond to the Shiite bloc's nomination, the deployment of more soldiers in Baghdad continues to present a worrying development. The U.N. special representative for Iraq, Nickolay Mladenov said that Iraq's "special forces should refrain from actions that may be seen as interference in matters related to the democratic transfer of political authority," according to The Associated Press. While Maliki might portray deploying more soldiers as a security precaution, analysts say the timing tells a different story. “Everybody thinks he’s sending a message to every other potential rival,” said al-Khoei, who called the militarization a “really scary” development. “Nobody knows what Maliki could do."